Washington – By voice vote, the U.S. House of Representatives voted today to pass the Family First Prevention Services Act (HR.5456), a bipartisan bill to improve prevention and support services for children at risk of being placed in foster care. The Campaign for Children strongly supports the Family First Prevention Services Act (HR.5456/S.3065 in the Senate), the result of more than a year of bipartisan discussion in the House and Senate that will allow states to be reimbursed for providing preventive mental health, substance abuse, and in-home counseling services to children who are candidates for foster care, as well as their parents or caregivers, among several other important provisions. The legislation also extends the Title IV-E program to provide support services for foster youth transitioning to adulthood. The Family First Act also addresses the over-reliance of placing children in group care or congregate care homes. Studies have shown that children living in such facilities have poorer outcomes than their peers in family-based foster homes. The bill requires states that are using federal dollars for foster care programs to conduct an assessment of the child by a qualified individual to determine whether a residential treatment setting is needed for the child. Court reviews are also required to ensure that children are not unnecessarily placed in a group care setting. A number of other provisions aimed at reforming and strengthening the child welfare system include the extension of the Title IV-B program, improving supports for youth transitioning to adulthood, establishing model foster care licensing standards, and calling for a GAO review to examine compliance of states in reinvesting savings from the federal adoption assistance reimbursement for special needs kids. This legislation has the potential to have a far-reaching impact in the lives of foster youth and their families and is an important step towards reforming federal child welfare financing. 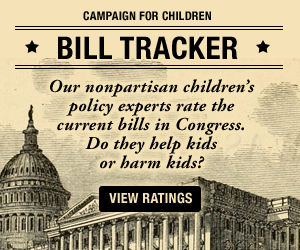 Last week, the First Focus Campaign for Children sent a letter to the House Ways and Means and Senate Finance committees expressing its strong support for the bill. A diverse coalition of more than 50 state and national child welfare and advocacy organizations have also expressed their support for the legislation.